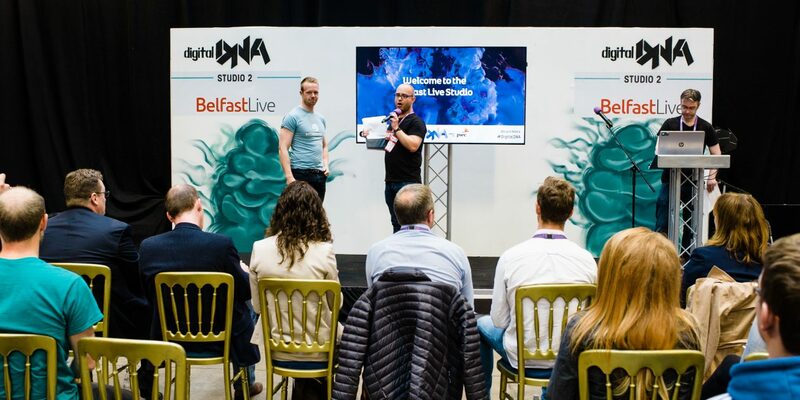 Established in late 2011, Belfast-based Flint Studios burst onto the technology scene as the newest digital startup in Northern Ireland. Six years on, the company boasts a team of more than 30 digital experts; over 200 high-calibre clients throughout the UK and Ireland; and an abundance of awards including Digital DNA Digital Company of the Year 2017 and 2017 Technology Business of the Year at the Business Eye First Trust Bank Small Business Awards as well as ranking in the Ireland Deloitte Technology Fast 50. Having achieved success in the startup arena, Jeremy Biggerstaff, Flint Studios Managing Director, felt strongly about giving back to the sector and sharing the many lessons learned. To that end, Flint Studios partnered with Digital DNA as sponsor of the 2018 Startup of the Year Award, offering the winner mentoring support. Keen to understand the challenges currently faced by startups, Flint Studios hosted a roundtable discussion attended by several of the companies shortlisted for the Digital DNA Startup of the Year Award. The discussion was led by Managing Director of Flint Studios, Jeremy Biggerstaff, alongside Flint Studios Chairman, Colin Coffey. Joining the discussion was Kiran Bhagotra, CEO, and Founder of ProtectBox, a cybersecurity comparison website and marketplace for small and medium businesses, and Fearghal Campbell, Co-Founder of PitchBooking, an online marketplace for the rental of sports facilities. JB: In your opinion what do you believe to be the two biggest challenges experienced by digital startups? FC: When we first had the idea for Pitchbooking about two years ago, we didn’t really see it as a business. We just thought it would be great if in our local community, instead of phoning around everywhere on a Friday night to try and find somewhere for a game of five-a-side, there would be a platform where you could look up and see what nearby facilities are available and at what time. At that stage, the biggest challenge was going up against already established companies and trying to get someone to take that leap of faith with us. Right now, the big considerations for us are trying to ensure there is enough money to keep going and whether to apply for funding. KB: I’d say the two biggest things for me are funding and sourcing technical talent. Sales, business development, marketing, I can do all those things, coding is about the only thing I can’t do. ProtectBox is effectively three different systems, there’s a front end, a back end, and an algorithm. As a very customised e-commerce platform, I need to find someone who can do bespoke coding, but who can also link up the back end. So, I’d say hiring technical talent that is both capable of managing the entire end to end process but then also affordable for a startup at the same time. CC: Whether your forecast is sales or cost or time, it is about creating a process where you can manage all those variances effectively, knowing the impact of those variances on what your business is going to be, and then giving yourself the time to deal with it effectively. The other massive challenge for startups is trying to get to the stage where you’re continually working on the business rather than working in the business, and that can be very difficult in startup mode. JB: What are some of the challenges that have occurred when outsourcing or hiring technical resources or talent? KB: I’ve pretty much ended up outsourcing everything, mainly because I couldn’t find the breadth and depth of capability. All my global customer support is outsourced, so is the technical development, and so is the marketing. I have recruited interns and technical staff with non-traditional (non-coding) backgrounds as they’ve got the creativity to help me with the overall user flow development. FC: We have hired. We have one single developer, so he is very much involved. He has come on close to full-time for us, which is basically afforded through funding. JB: In my experience there is no right answer. I think the one thing that I’ve spotted is it’s becoming increasingly difficult to do it yourselves, I think any startup that can afford somebody on the technology side should do it, but you should then also lean on the external expertise that’s there. CC: Obviously the technical support is key in the spaces that both of you are in but there are other issues as well that are going to come up as you build. I think the key thing is getting partners in place that you can rely on, and then trust that will develop. If you achieve that then that shares the pain because, in startup mode, it’s lonely, it’s relentless, everything comes to your table and you must deal with it. So, if you can surround yourself with partners who trust in you and can help you develop going forward, I think that is a massive plus. JB: I think the problem is that everybody has the perception that technology has moved on to the point where it’s easy and straightforward. That’s not the case. The security or the integrity of data can become hugely challenging. I think, having the courage of your conviction that particularly as founders, you both know what you want and what you need, that you will go after that. The ultimate goal is user experience and ease of use. Twitter was a technology that was reinvented 20 times, the guy who invented Twitter just happened to be the one who did it right. FC: Yes, there are definitely competitors, somebody is going to do what we are trying to do, and they’ll do it right within the next four or five years, we’re just hoping that we’re the ones who get there first. JB: Do you think Northern Ireland has presented any unique issues for startups? KB: I think Belfast has done a really good job of promoting the development talent that it has. It can be tricky to get development talent because there are big companies vying for that same talent as well. JB: When I was young, all you got was announcement, announcement, announcement on manufacturing jobs and really, they’ve iterated that into cyber security, IT, financial services. Really, the benefit to Northern Ireland isn’t creating jobs, it’s wealth creation. So, if you can find the right model and the right process, you will ultimately create wealth for Northern Ireland which is really what this country needs. KB: Also, another real positive. Belfast is one of the best, if not the best that I have seen at helping startups export and not just big companies. Most governments or most government bodies will tend to only help the bigger established players. Belfast is one of the few that will look at a very, very early stage. JB: Are you both working to a defined plan or strategy, such as a written down objective, or have you got a defined way of working towards what you are trying to achieve? FC: I suppose we have a strong plan of attack, but we’re very open to change. So, strongly defined but also lose enough so that it can adapt if required to. The stage we’re at we do see changes quite regularly in terms of the direction we are taking the product in. I suppose any two-sided marketplace company has this and it’s how you balance the two. We’re really looking at how we can drive the revenue growth for whatever customers we have currently. We have a percentage revenue increase that we try to hit every month now, and that’s probably the number one metric that we’re striving towards in the business. KB: For ProtectBox, we spent our first-year road testing and refining our plan and strategy. So that they’re scalable because the product is built in such a way that it’s plug and play so that new supplies can easily be plugged in and new partners can easily be plugged in, so it’s already built to scale. We’ve a number of government and corporate partners waiting for our launch, to start working with us to help us scale. JB: From our perspective, if there’s anywhere we can add value, if there’s anywhere we can give you something back, we can certainly try to give you a bit of assistance. We spend our lives steeped in eCommerce projects and content projects. So, anything on that level we can help you with. For us, working with startups adds real value as our staff enjoy working on projects with startups as the variety is really motivating.